Today I signed up today for the 2 Oceans Trail run. That’s one run. 2 oceans. 22km. I don’t naturally have the physique or stamina for long-distance running. But I’m nothing if not enthusiastic (well, sometimes), and since discovering that despite the non-stop pouring rain, the soaked feet, losing two toenails AND a set of headphones, I LOVED running the Paris 20km… I thought it was time for A NEW CHALLENGE. With views like the above, it’s no surprise that I was drawn to this particular run. Somehow the Great North Run, just doesn’t have the same appeal. So, today I managed 6km despite this morning’s rain. I then followed up with bit of Muay Thai pad work with the boys at the gym this evening. Day 1 of training seems to have left me with a dodgy knee. Though I’m hoping that may have been caused by sitting on the floor wrapping christmas/chanukah presents in front of the fictional District 9 – complete with obvious references to the real District 6 which lies just below the route I’ll be running on 29 March 2013. Any other suggestions on how to stay motivated most welcome. And even better if you want to join me for a run. 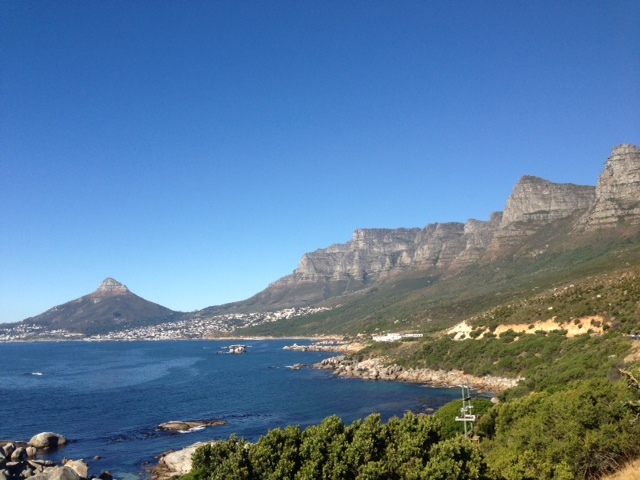 This entry was posted in Africa, cape town, motivation, sport, travel. Bookmark the permalink.